I've been blogging for eleven (non-continuous, obviously) years, and I decided to do a simple crossover to remind everybody that these pages are alive (if only of a sort, to varying degrees, least of all here at POTA.) It's a nice one to discuss too, because this is little seen promo art from possibly my favorite Ray Palmer comic. I believe this Steve Dillon piece was colored for one of those DC Universe advertorials that ran in comics of the period, but it was (appropriately?) reproduced at about the size of a postage stamp, so the presentation here is easier on the eyes. In Central City, early in their careers O.G. science bros Barry Allen and Ray Palmer double date with Iris West and Jean Loring at a local diner. The nerds dominate the dialogue, leaving the lassies to pass out in each others' arms. A radio broadcast is interrupted by word of a Mr. Element sighting in the diamond district, giving our heroes another excuse not to deal with their issues with women. The Atom and The Flash suit up, and the Tiny Titan is swiftly playing punch face with his foe Chronos. The time bandit marched on, however, and joined Mr. Element in crafting a particularly nasty hourglass-themed trap for the Scarlet Speedster that the Mighty Mite had to smash like a bullet. It all proves to be a distraction, as the Atom is immobilized by a pair of tiny energy bubbles. "What's the matter, Atom? Can't reach your glove controls? How do you make a clock ineffective, little man? You take away its hands!" Chronos/Atom proves himself among the least polluted ersatz Leaguers. He vomits on Element/Flash's back after a super-speed jaunt, and peeks under the mask to learn Atom's secret identity, but otherwise is fairly well behaved. Chronos/Atom locates Jewel Kryptonite sought by Agamemno in a shrunken Daxamite city held by a deactivated Briainiac on an underwater ship. "Three-time loser David Clinton" is distressed by his being hero-worshiped by the Daxamites, who see "The Atom" as their last best hope to return to normal. Chronos/Atom is unwilling to abandon them once he's served Agamemno's plot, as he's "a thief-- not a monster!" However, Lex Luthor/Superman has no qualms about massacring the entire city under his boot of steel to prevent any other super-beings showing up on Earth, and Clinton is ultimately shamed into joining in on the stomping. 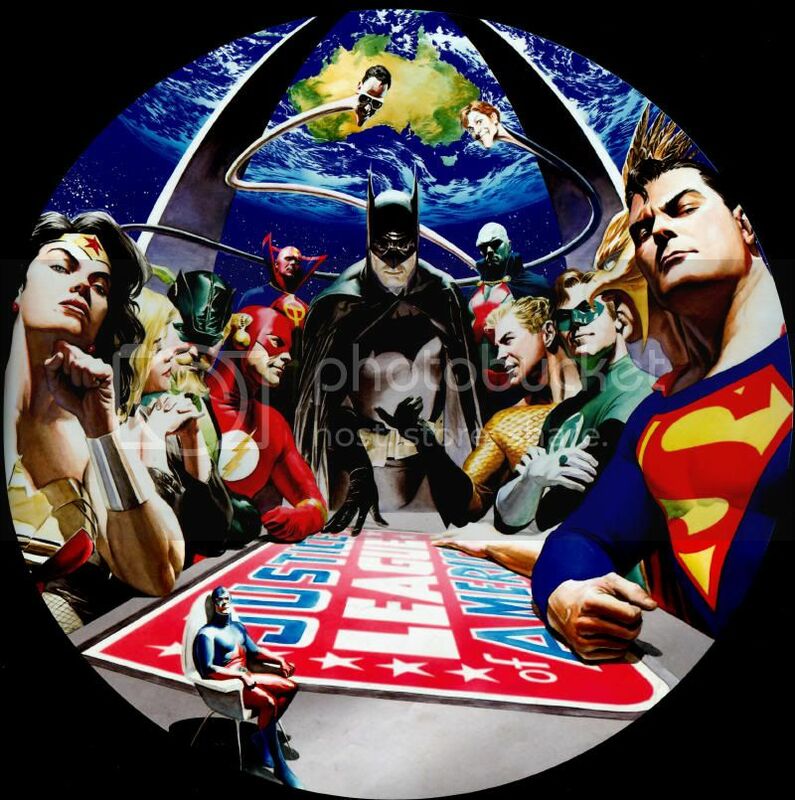 Snapper Carr alerted contemporaneous heroes about the Secret Sanctuary jailbreak, as the "Justice League" was preoccupied with completing their nefarious missions for Agamemno. Word reached Challengers Mountain, where its defenders used the internet and closed-circuit cameras to locate the Flying Sundial of "Chronos" as he's breaking into Ivy University. 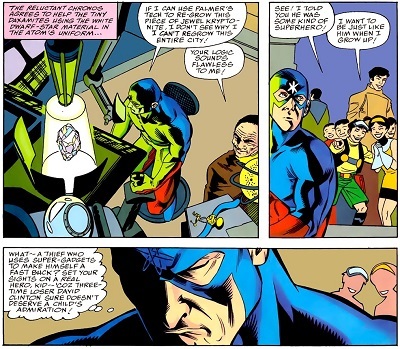 Ray Palmer was looking to use Professor Hyatt's time pool, which would require shrinking himself, but he inadvertently shrank the Challengers when they crashed into his lab. 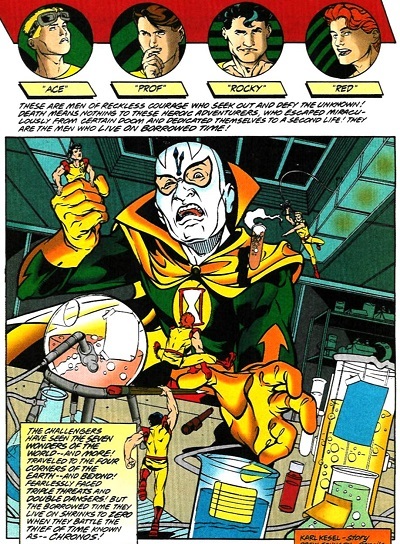 Even at doll size, the team prove a headache to "Chronos," until the Challengers' brain Walter "Prof" Haley determines through his delicate resistance that they had actually been fighting The Atom! Ray declares Haley the smartest person in the world, and they'll need it. The Challengers had only 15 minutes to return to normal size or else they'd explode, plus creatures from the future had begun crawling out of the time pool! The latter problem is resolved, but not with enough time to fix the former. Yet, the time pool is on their side, as "Chronos" lowers the Challengers into it to buy time. The heroes are restored, but not before seeing visions of their (sometimes dire) future selves, as well as the strange, unfamiliar heroes who will help them combat the body-swappers. Chronos in the Atom's body joined the majority of the "Justice League" on a trip to Thanagar to acquire the Absorbascon. They were attacked by "Sinestro," who managed to use the Oan central power battery to cause the heroes and villains to revert back to their original bodies. Unfortunately, this also provided the Injustice League access to connect the Absorbascon to the power battery, which through the engineering of Lex Luthor and Chronos, allowed the villains to overcome Hal Jordan and the entire Green Lantern Corps. Dr. Light joined the majority of the "Injustice League of America" on a trip to Rann to bind their acquired artfacts into a new body for Agamemno. 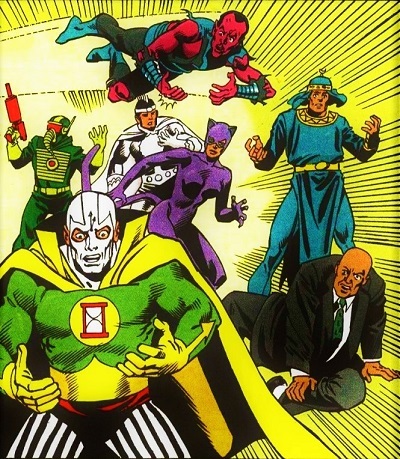 While Rann suffered their presence, on Earth, Deadman gathered a team of previously unaffiliated period heroes into a 7 Soldiers of Victory revival to address this building crisis. Arthur Light was seen taunting and shattering the shield of Gardner Grayle during his lone adventure billed as "Shining Knight." Metamorpho came to the rescue, replacing Grayle's shield and activating a freeze ray built into his unfamiliar power armor that incapacitated the cowardly Light. However, Chronos and friends continued to utilize the artifacts to thwart capture and to betray Agamemno, claiming his power as their own. Flashback: Prior to the start of the event, Agamemno watches the Justice League of America on an alien world to determine their mettle. 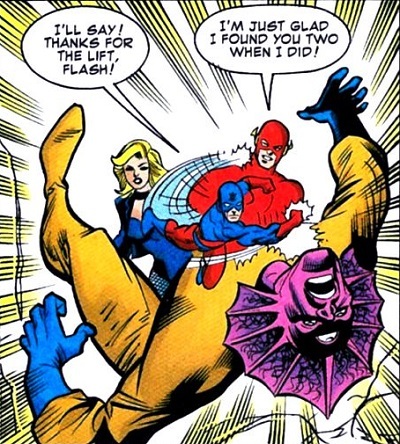 The Atom was paired with Aquaman, who was concerned about leaving Earth protected in the League's absence. 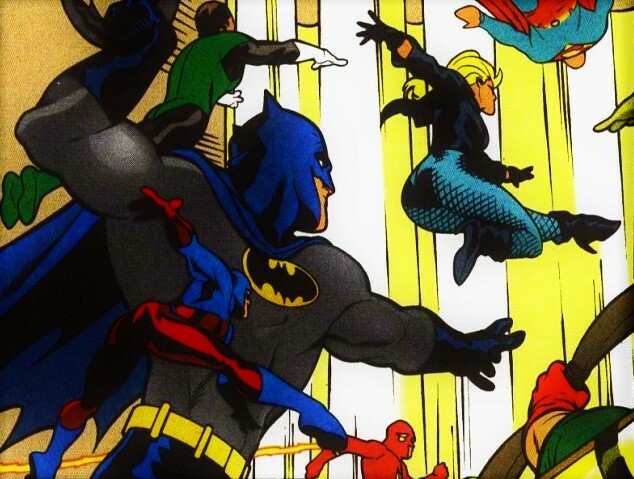 Ray offered the Doom Patrol as at least a temporary substitute, but Aquaman dismissed them even more quickly than he did Atom's concerns that what Arthur was about to dive into might not be water as we know it. Aquaman soon went missing, leaving the Mighty Mite alone to locate another Leaguer. He finally found Black Canary, who attacked him until she realized Despero doesn't change sizes. For the record, she's not a natural blonde. 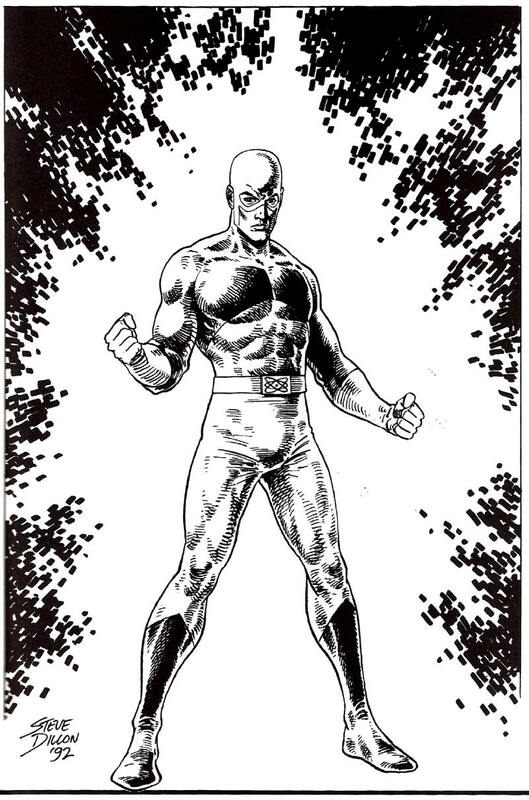 Soon enough, the real Despero was located, a Canary Cry destroyed his means of teleporting away, and the Tiny Titan delivered the knock-out punch. None of this is particularly relevant to the larger story, but Atom doesn't have much to do in the resolution of that, and I wanted to add another nice picture before we wrapped this up. The nigh-omnipotent Injustice League threatened our heroes' loved ones, so among others, Jean Loring was rushed to Gorilla City in Africa for hiding. When that failed, the heroes went on the offensive, but a miniaturized Elasti-Girl & the Atom couldn't even overcome a mouse trap constructed by Catwoman's new purple power ring. Near defeat, the vision of future heroes finally came true, as Martian Manhunter brought Robby Reed and his magical H-Dial to transform the League into new identities. The Atom became the robotic Mod-Man, and Thanagarian Wingmen also joined the fray, but the day was mostly won by J'Onn J'Onzz, Deadman, and a revived Green Lantern Corps. "This meeting of the Justice League is now called to order! The World's Greatest Superheroes are gathered together on this stunning Collector's Plate featuring art by the acclaimed Alex Ross. This limited edition, hand-painted Collector's Plate measures approximately 10 1/2" in diameter, features a certificate of authenticity imprinted on the back of the plate and is edged with a 24-karat gold band. Packaged in an elegant black gift box with foil stamping." Limited to 1700 editions, this item now sells for upwards of $199.99. It's presented here as part of today's celebration of Martian Manhunter's 61st birthday. FIRST IN A SERIES OF COLLECTOR'S PLATES! to defend the world from danger! It's been a lot of years since I missed my opportunity to buy the swell JLA-themed Monopoly game at a reasonable price, and it's even been over three years since The Irredeemable Shag did a spotlight article on his copy. 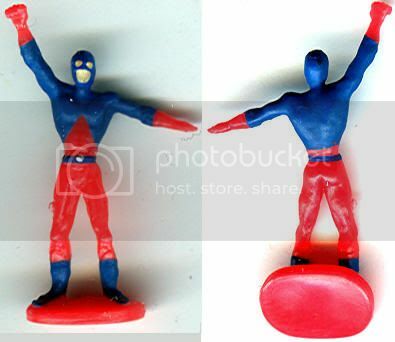 The Atom didn't have a major role in the game, which stopped at the inclusion of the first expansion member Green Arrow, but I figure it's about time to do a post on his appearances on its “The Batcomputer” cards. 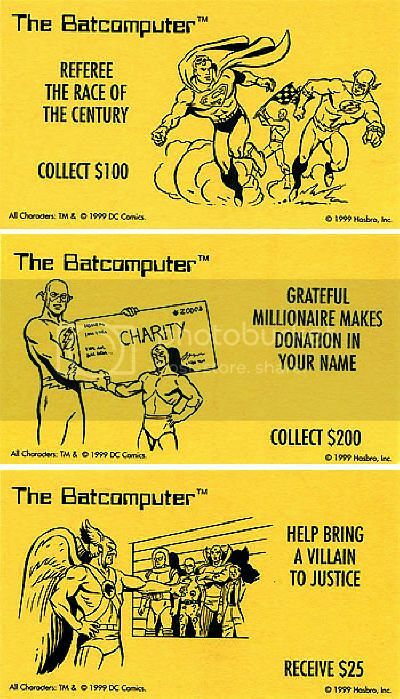 The Super Friends equivalent to “Community Chest” cards offer the Tiny Titan to "Referee the Race of the Century," and enjoy when a "Grateful Millionaire Makes Donation in Your Name," plus Hawkman and Chronos are worked in on "Help Bring a Villain to Justice." They're pretty boss, and hey, if you really want to play the game as the Mighty Mite, you can always throw this guy on the board. Speaking of which, you can see all of Shag's tubular scans here! Originally designed for our JLI lovin' friend, we couldn't wait to share the pattern with you. 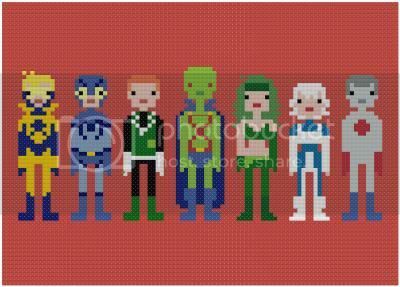 Featuring Booster Gold, Blue Beetle, Guy Gardner, Martian Manhunter, Fire, Ice, and Captain Atom, this is a quick stitch for the comic book fan in your life! This listing is for a PDF file of the pattern, not the finished product. (That's in another section of the shop!) You will need Adobe reader to open the files, which you can get free from get.adobe.com/reader. The digital file will be delivered via email within 24 hours of payment. The pattern will be sent to the email on file with Etsy, however if you would like it to be sent to a different email, please specify in the 'note to seller' box during checkout. Due to the nature of digital files, no refunds can be given after the email is sent to the buyer. There is a small window of opportunity before the PDF is emailed where a refund may be issued if desired. Hembeck! kicks it Maguire style with an old school twist. 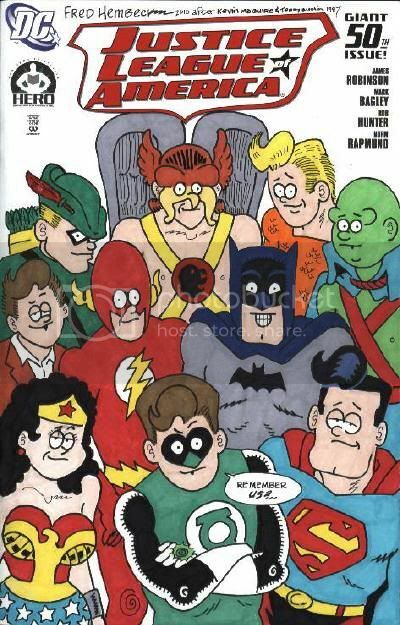 The entire founding Justice League of America, including early inductees Green Arrow and Hawkman, plus Snapper Carr. "Remember us?" Well, I kind of remember the Atom joining between Ollie and Carter. How about that, Fred? In late 2000, a consortium of comic publishers came up with the idea to create a financial safety net for comic creators, much in the same fashion that exists in almost any other trade from plumbing to pottery. By March of 2001, the federal government approved The Hero Initiative as a publicly supported not-for-profit corporation under section 501 (c) (3). Since its inception, The Hero Initiative (Formerly known as A.C.T.O.R., A Commitment To Our Roots) has had the good fortune to grant over $400,000 to the comic book veterans who have paved the way for those in the industry today. The Hero Initiative is the first-ever federally chartered not-for-profit corporation dedicated strictly to helping comic book creators in need. Hero creates a financial safety net for yesterdays' creators who may need emergency medical aid, financial support for essentials of life, and an avenue back into paying work. It's a chance for all of us to give back something to the people who have given us so much enjoyment. ALL 104 JUSTICE LEAGUE #50 ORIGINALS…NOW ON DISPLAY! Please enjoy this gallery of ALL 104 original Justice League of America #50 Hero Initiative covers! • Jan. 20-22, 2012, Tate's Comics, Lauderhill, FL (Miami/Ft. Lauderdale area): Display of remaining covers and auction of second one-third. 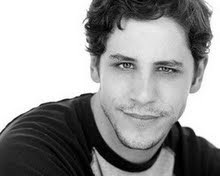 • Feb. 17-19, 2012: Orlando MegaCon, Orlando, FL: Display and auction of final one-third. All covers will be sold via LIVE AUCTION on-site at the venues above. If you cannot attend but wish to bid, proxy bidding is available. Deadlines for each grouping are below, and each cover carries a minimum bid of $100. Special thanks to Firestorm Fan for the notice! It's been nearly a year since my last update to this blog in any capacity, and to be honest, I'm not sure when I'll get back to working here again. 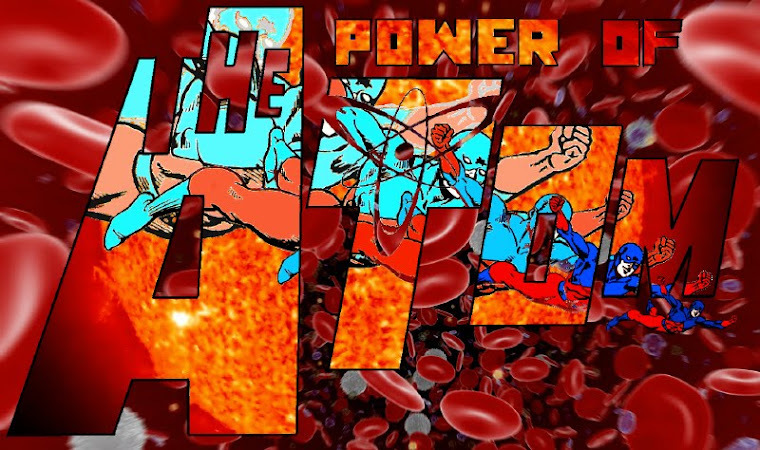 In the realm of podcasting, Aaron "Head" Moss has begin covering Sword of the Atom, while Jay "FKAjason" Jones, his son Vance, and Roy “Charlemagne” Cleary cover both the Silver Age and Post-Crisis Captain Atom via The Silver & Gold Podcast, plus the Nathanial Atom blogging on Splitting Atoms. There's no sense in my hoarding coverage of characters when others with greater love and time management skills are ready and able to fill the void of my inaction.